Christmas is among those important holidays to spend with our family, friends and loved ones. The Ritz-Carlton, Shenzhen treats guests to a night of delight with an opera performance, ballet dance, songs of love, joy and happiness, and more to mark the start of the annual celebration of the best season of the year. 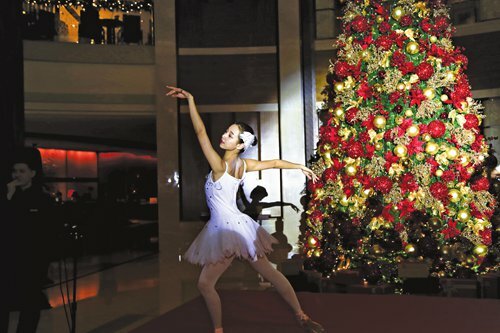 The festive season began with "The Opera Night" Christmas tree lighting ceremony 2018 at The Ritz-Carlton, Shenzhen. The ceremony welcomed more than 100 guests and members of the media. The choir from Shen Wai International School, which was invited to perform with the Vienna Children's Choir, brought the audience festive joy with lovely Christmas songs. Santa Claus also came bringing exquisite presents and tailor-made candies from the hotel. The dramatic three-story atrium of the hotel lobby, echoing the lobby's design with a focal curved wall made of wood and back-lit golden-hued onyx, made the perfect traditional opera house and took the guests into a festive European setting. This year, the hotel once again presented an artistic night with classical Italian opera and an elegant ballet performance. In partnership with Shenzhen Min Ai Disabled Children's Welfare Center, Iwan R. Dietschi, multi-property vice president and general manager of The Ritz-Carlton, Shenzhen, launched the "Gingerbread House" charity event, which is now in its ninth year of combining the "Community Footprints" program of The Ritz-Carlton with the festivities of the season. Started in 2010 by Dietschi, this program has become a tradition of the hotel to help the children of Shenzhen Min Ai Disabled Children's Welfare Center. "I am proud of our Ladies and Gentlemen. They have made this meaningful event a tradition, which is now in its ninth year, and this is a memorable milestone for us to treasure." The charity event will last until December 31. Everyone can join in by purchasing a gingerbread brick to put their personal name or photo on it, which will be used to construct a charming gingerbread house built with love. All proceeds will be donated to Shenzhen Min Ai Disabled Children's Welfare Center on December 31, 2018. For the upcoming festive season, The Ritz-Carlton invites all guests to embark on a gastronomic journey in the oasis of luxury with your loved ones and build memories for life. With the seasonal buffet celebrations at Flavorz, themed afternoon tea at Onyx, a romantic dinner at Paletto Italian restaurant, or the countdown party at Curv Bar, The Ritz-Carlton, Shenzhen is set to bring you a wide array of exciting celebrations to welcome a marvelous 2019.